Where do I begin? This was my first time attending Recipe for Change and it will most definitely not be my last. According to news on the internet, this inspirational food event is Food Share’s largest fundraiser and brought in over $40,000 from Hogtown’s most generous citizens. 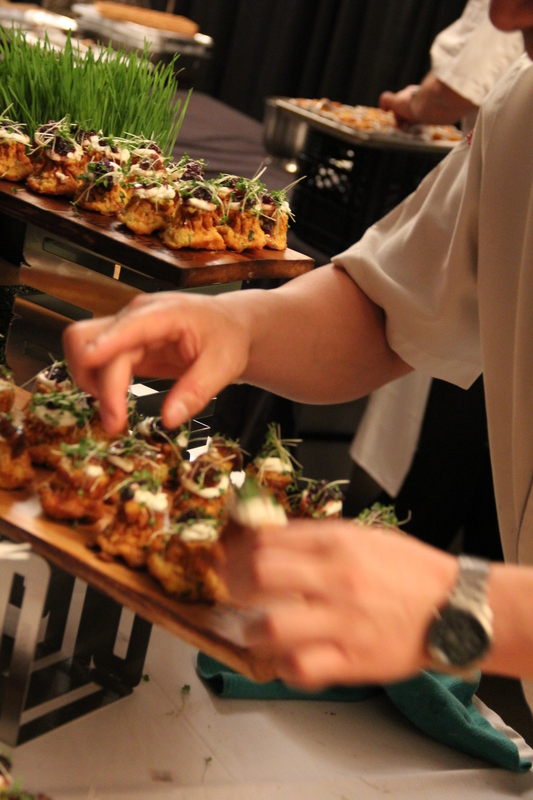 Guests wined and dined their way through 30 food stations, 30 VQA wines and 9 local beers while mingling with top chefs from across Toronto. With that many tasting stations, there was just no way that I was going to be able to ingest that much food. Nevertheless, I was up for the challenge and decided to tour around to try and narrow down the choices ~ a dry run if you will. I was amazed by the culinary creations of these incredibly talented chefs. Not only were the tasting plates a visual treat but many stations were creatively set up. The second difficulty I quickly realized was that it was going to be a bit of a juggling act to carry a wine glass, napkin, utensils, whatever tasty treat was next on a plate and take photos without dropping anything. Fortunately, I had a large purse that easily accommodated the glass and napkin wrapped utensils. Pictures first… taste second. This event definitely had more than enough food options, regardless of your diet choices, be they raw food, vegan, vegetarian or carnivore. HOOKED, Dan and Kristen Donovan, Cooke’s cove PEI oysters served with housemade horseradish, Ontario Riesling Mignonette, Hooked Hot Sauce and lemon. My choice of topping: the Ontario Riesling Mignonette sauce. No plate required for these succulent little morsels. Just slurp them free of their shell and enjoy. I wonder… how many shells did those shell shuckers shuck, when the shells they shucked were getting snapped up faster than they could be shucked? 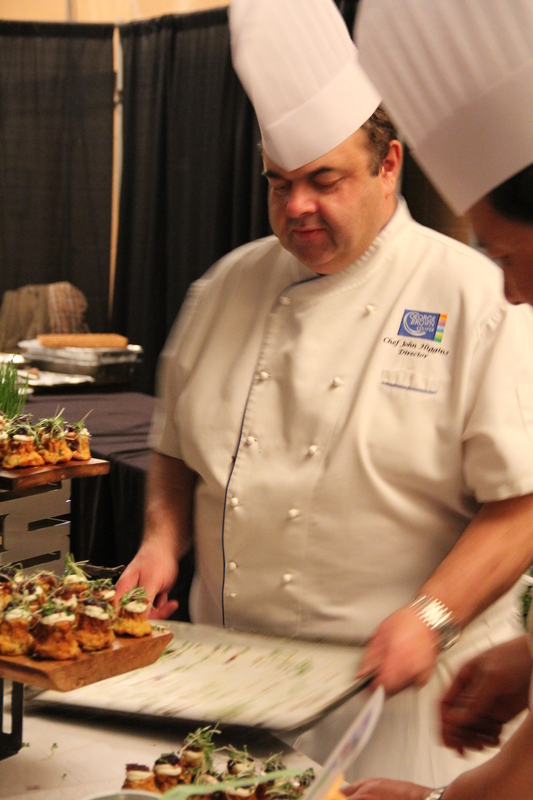 One of the top contenders for the People’s Choice Award was LE SELECT BISTRO. Chef Albert Ponzo plated seared rare Albacore tuna that melted with each bite. The fish was topped with heirloom tomatoes, radicchio, black olives and walnuts. I came around to this table a second time because the tuna was just absolutely incredible. FRIDA RESTAURANT & WINE BAR ~ Jose Hadad was serving Pescado al Mojo de ajo (butter kissed grouper with roasted garlic on a slice of fresh baguette and a vegetarian soft taco. Both offerings were amazing and the butter kissed grouper was incredibly succulent and flaky. I will be visiting their restaurant in the near future. I took a tour through the silent auction items too distracted by the food stations but needed to keep moving to help burn off the calories. It should be noted that I did not sit down. Does that mean that most of the calories were burned because I was eating on the move? Hopefully? Possibly? Somewhat? Not really? No? Darn! Next came the vegan offerings of CRUDA CAFE…. Claudia Gaviria of CRUDA CAFE offered tiny vegan tarts. Love Me forever Vegan Tarts (my only dessert of the evening) were lovely beet-infused crusts of coconut and almond that were filled with cashews, lavender flowers and agave. A sprinkling of pomegranate seeds finished the presentation on these rosy-hued treats (which I did not get a picture of). I also tried their Raw Truffle King Oyster Mushroom tarlets (plated below). These tasty tartlets have sparked an interest in vegan food that I am going explore. Uh oh… do I see another recipe book being added to my ever-expanding library? That would be a YES! PALAIS ROYALE ~ Steffan Howard created rosemary smoked duck breast served with a mousse of duck confit topped with a blueberry and raw chocolate coulis, dusted with ground cacao nibs and whimsically presented atop a glass tower on bamboo rafts. He was also suggesting that they went very well with his neighbour’s Cabernet. FROGPOND FARM ORGANIC WINERY ~ Their 2008 organic Cabernet Franc was indeed the perfect pairing, as suggested, by Steffan Howard who was next door serving his exquisite duck. Ruby red with a spicy earthy nose and rich raspberry/blackberry flavours as well as a hint of pepper and subtle tannins (per the description from their website). FIDEL GASTRO’S – Next to a gaudy but humorous bust of The King: Elvis, Matt Basile was offering a PeKing Elvis sandwich: a butter grilled pita with spicy orange duck meat, green onion and the King’s secret sauce. Did you know they also have a food truck wandering the streets of Toronto? I will have to keep an eye out. I think I recall seeing an Eat St. episode on the Food Network that showcased food trucks in Toronto. 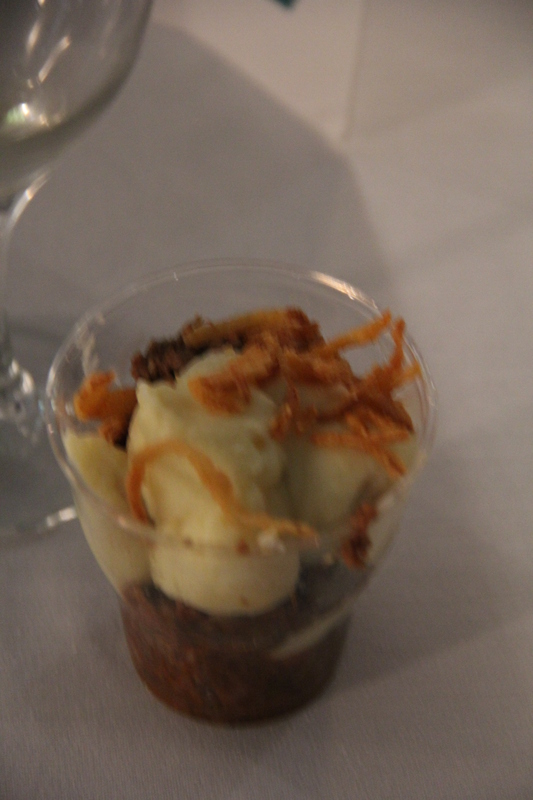 BARQUE SMOKEHOUSE – Dave Nienstein and sous chef were filling up parfait cups with smoked brisket, sour cream-mashed potatoes, crispy onions and plenty of barbecue sauce. Very tasty but the cup didn’t seem to have a bottom to it. Have you ever had one of those meals where it seems like the more you eat, the more there seems on the plate? I kept spooning it out but the cup didn’t seem to want to empty. CHATEAU DES CHARMES – Their Brut Methode Traditionnelle, Estate Bottles 2010… a palate cleanser and something cool to drink. Ah yes, that hit the spot. Odysseas Gounalakis at SCHEFFLER’S DELI was serving melted Raclette over rustic bread and gently placing a thin slice of speck on top. A-mazing! Now the contraption that they were melting the raclette on is a chef’s dream. Fortunately, I don’t have the space so my bank account won’t start trembling at the thought that I may go out and buy one. Won’t even think about it… much…. My last dish of the night was a stuffed date by Chef Luis Valenzuela. The TORITO TAPAS BAR chef, who is soon to open a new Queen West location, filled Medjool dates with Toscano cheese and roasted almonds, then wrapped them in double-smoked bacon and finished them off with a sprinkling of sea salt. There was a lot of buzz about the appeal of this dish and it ended up winning the People’s Choice Award. EASTDALE COLLEGIATE INSTITUTE ~ Culinary students dished out squares of layered apple torte topped with frozen lemon curd, whipped cream and a twist of lemon. Another thing that I really enjoyed was speaking with the chefs as they described the dishes they were offering. Their passion and enthusiasm to inform everyone really brought another element to this incredible event. If I had to pick any single must-attend food event to go to in the city it would unequivocally be Recipe for Change. In my opinion, it far surpassed the Gourmet Food and Wine Show (certainly the food portion of this show) and it’s a great way to contribute to the community. Food Share Toronto… if you are going to publish the 2013 Recipe For Change recipes… I will be first in line to purchase the book! WELL DONE and BRAVO [insert standing ovation] to everyone who organized, volunteered and contributed to this event!! It was! I’d say it’s the food event of the year that should not be missed. If you only go to one food event this year ~ this is THE ONE to go to!